I have to admit, I’m in love with Cupcake Wars. I am fascinated watching shows like that and Chopped on Food Network, because I think it’s so neat watching people come up with recipes on the fly, with all these interesting flavor combinations! This past week I was watching with my parents while home for Easter, and the episode had several people using red wine in cupcakes. This, of course, intrigued me, and I immediately starting looking up wine cake recipes. Unfortunately, it seems that the chocolate-red wine combinations has the chance to make a dry, very dense cake, and all the white wine cake recipes I found started with boxed mix (um, no – to me, that’s not really a recipe!). After searching around for a bit, I randomly found a champagne cake recipe, and decided to give it a whirl. For these cupcakes, I made a champagne cupcake batter, a very light strawberry and champagne cream filling, and a champagne buttercream. 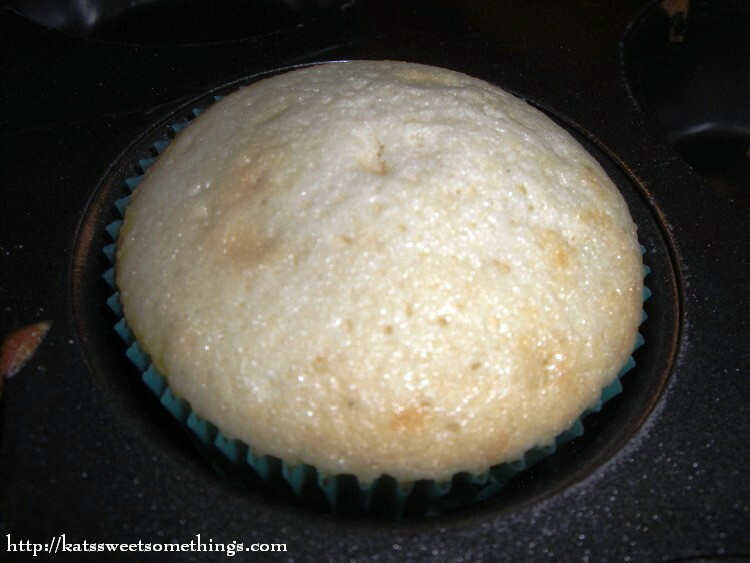 The champagne cupcakes are interesting – they come out a very pale color (not really golden), and the inside crumb is almost a combination between a cupcake and a bread – dense, but slightly sweet. 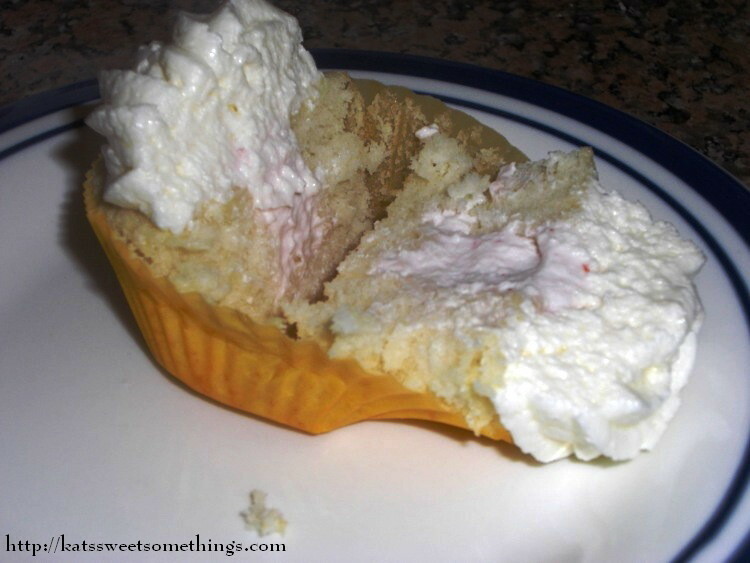 I can’t quite think of another item that has a similar texture – but the cupcake is definitely good! The strawberry filling didn’t turn out quite the way I had hoped. I had originally intended to make a raspberry filling, but apparently my grocery store had a shortage of unsweetened raspberries, so I had to switch over. When I pureed the strawberries, I added some champagne in there to hopefully mix the flavors. 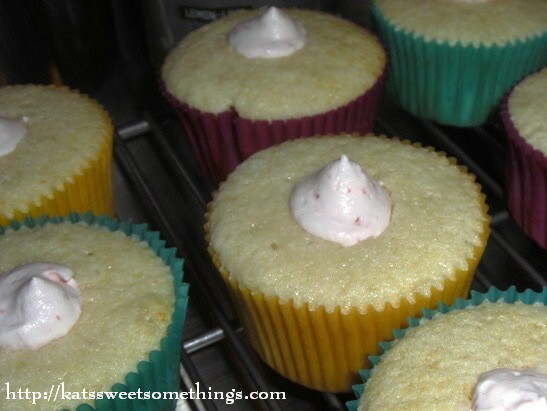 But when added to the cream mixture, I seemed to need a lot of strawberries to get any flavor at all, and I didn’t want to have an overpowering strawberry flavor to these cupcakes. 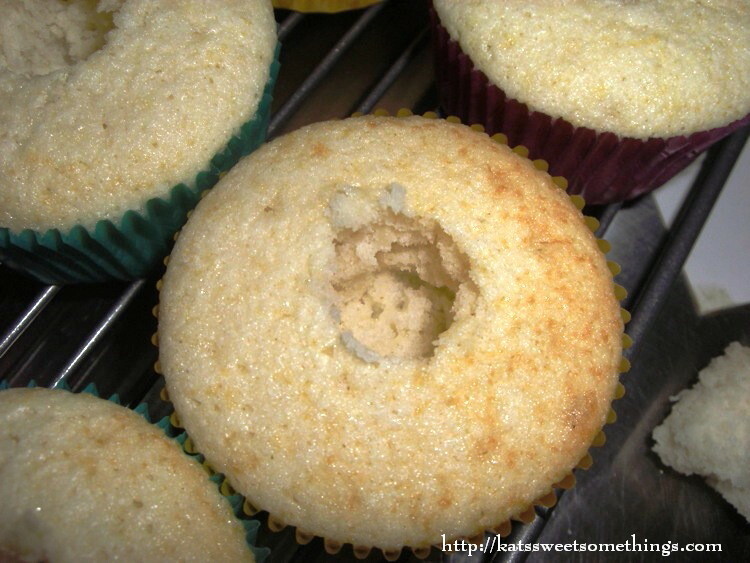 As for the buttercream – very interesting. I didn’t have the shortening the recipe called for, so I went with straight butter (which is what we tend to do in school anyway). After mixing everything together, I tasted no champagne, and just sweet butter. Because of this, I started pouring more and more champagne into the buttercream to try to get the flavor in. I think it ended up alright, but if I made this recipe again, I would definitely use a sweeter champagne, or perhaps Moscato, in both the cake and the buttercream – something with a more intense flavor. All in all, the cupcakes are pretty good, and many people sure seem to like them! The day I made them I wasn’t as pleased, but I tried them again this morning, and overnight the champagne flavor seems to have come out a little bit – to be honest, I feel like I can almost taste a hint of the bubbles! I think that these are definitely something that needs to sit overnight before serving to allow the flavors to really develop. 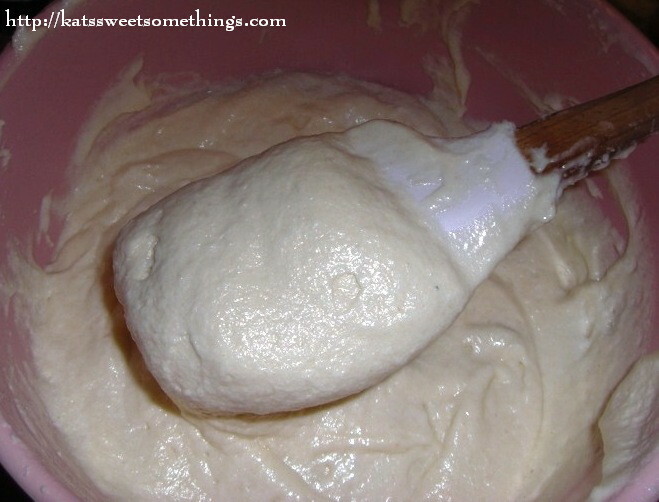 Soften butter in a mixer with paddle attachment. Slowly add in a champagne and powdered sugar, alternating until everything is completely combined. * For this recipe, it originally only called for 1.5 sticks of butter, plus 3/4 cup of shortening (which I didn’t have). It also only called for 3 Tbsp of champagne, but when I sampled the buttercream, it had absolutely no champagne flavor, so I kept adding more until I could taste it. In a mixer with a whisk attachment, start beating the heavy cream until frothy; add in sugar, and continue to mix on medium-high until soft peaks form. In a food processor or blender, puree strawberries and champagne until a paste is formed. 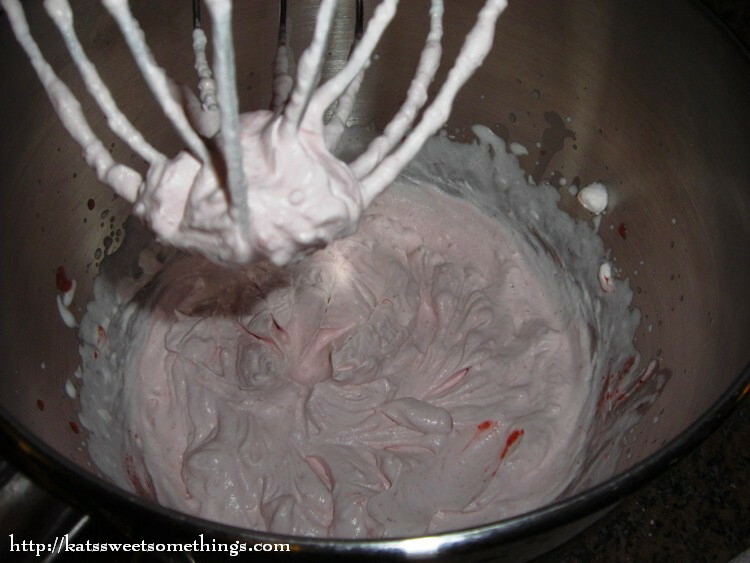 Spoon strawberry mixture into whipped cream to taste. 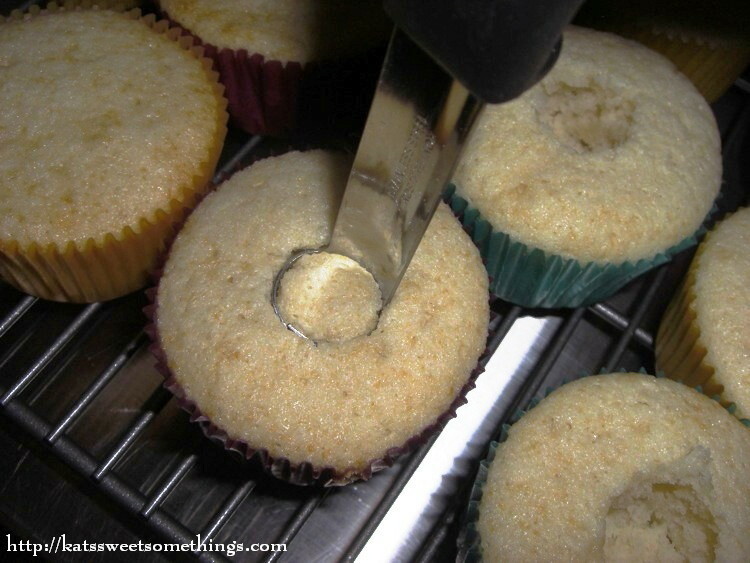 Take a corer and cut a piece out of the center of each cupcake (see picture below). 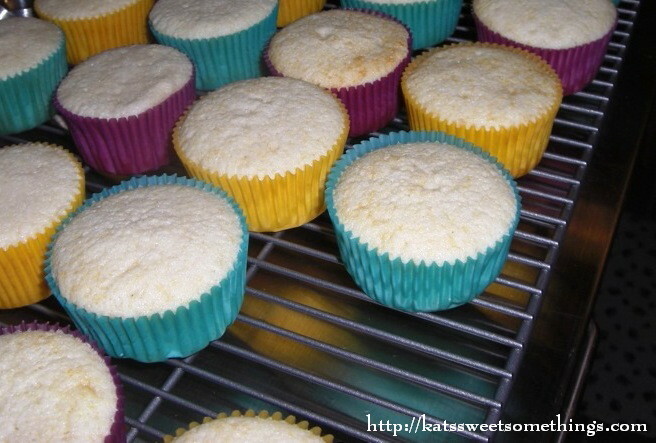 Using a pastry bag (with or without a large round tip), fill cupcakes with strawberry cream mixture. Using a pastry bag (I used an Ateco 824 tip), frost cupcakes with champagne buttercream leaving an edge of the cupcake visible above the wrapper. This entry was posted in Baking, Cupcake, Frosting, Fruit, Strawberry and tagged Buttercream, champagne, cream filling, cupcake, filling, strawberry, whipped cream by katj012. Bookmark the permalink. When I made this recipe some time ago, I used all-purpose flour and the texture was a light crumb. Maybe the higher gluten content doesn’t work as well with the champagne? They look delish, though! I’m not sure – possibly. I wonder also about the champagne itself. It was a brut, and I wonder if that leads to a dryer cake… either way though, it tastes yummy! Yum! How I miss your nummy baking, but I’m so proud of you and all you’ve accomplished! Wow, those sound really cool. I bet all the bubbles make the batter really light. Great filling and icing too.